As promised, I am here with the first of my healthy festive food ideas for sharing and keeping. Today’s little recipe is so tasty you will probably make it but end up keeping it for yourself. No shame in that. Even so, this more-ish, healthy treat is extremely easy to put together; a second batch to pop into decorated cellophane bags or cute jars will not be a chore. If you have a reasonably well-stocked wholefood kitchen you probably won’t even need to brave a trip to the shops. 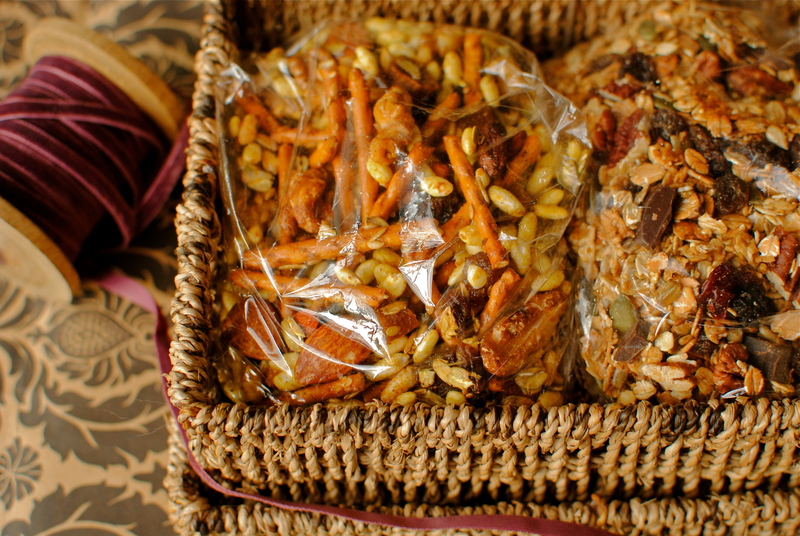 As a gift idea perhaps pair this Munch Mix with a batch of my Lower-fat Granola (add some dark chocolate chunks or chips to amp it up), or you could put it in a large Kilner-type jar with a vintage spoon. We are using a traditional Chinese spoon to self-serve out of our nearly depleted jar. Note to self: make a fresh batch soon. And speaking of giving homemade presents. Some of you may be thinking it seems a bit cheap, that spending a bit of dosh is expected. Well, my feeling is that it shows that you care enough about the recipient to spend time and creative effort. I won’t give homemade gifts to everyone (I would if I had more time), and my family at least will get a few bought things too, but it feels good to put together an array of ingredients and produce something to share. Unfortunately I am no cop at decorating and packaging things, but I hope my modest culinary efforts will gloss over the lack of visual finesse. I don’t want it to look too slick and production-line, now do I? Over the next few posts I will offer you my rhubarb and cranberry chutney, a Middle Eastern twist on chocolate bark, a fool-proof funky mayonnaise with accompanying wholegrain mustard, my favourite brownie recipe, and a few ideas on packaging up herbal tea and cocoa. 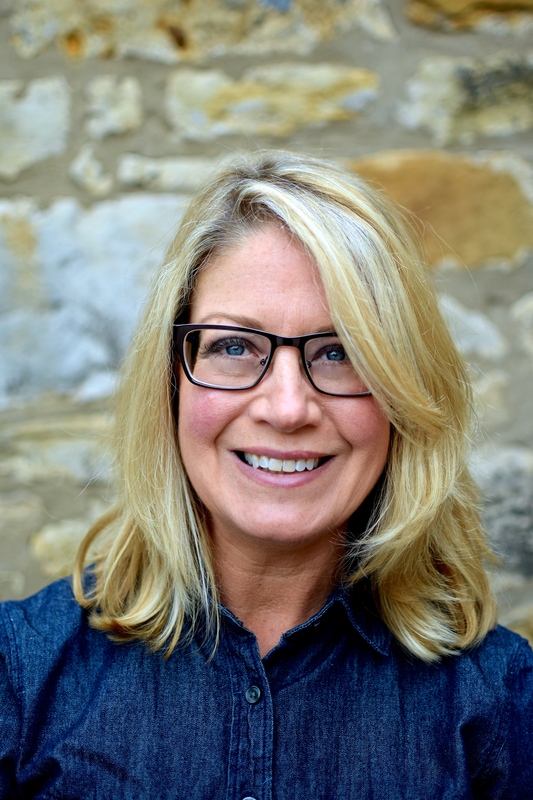 I also hope to give you ideas for cookbooks to buy for yourself or a foodie friend, and fun but functional kitchen gift paraphernalia recommendations, including an exclusive peek at a very good friend’s great new textile range. But for now, here’s my take on an idea I got years ago from the American Institute for Cancer Research website. It was a keeper. I hope this one is too. Before I get started I would like to share something my wonderful sister sent through from the Huffington Post. It’s not particularly festive but I found it hugely inspiring and motivating. The gist is that it is a collection of life lessons collated by a US gerontologist through the course of his work. He spoke with many elders over his career and found that some interesting and thought-provoking themes emerged. I rate all of the lessons but perhaps this one is the most applicable to my foodtoglow blog.“Act like you will need your body for one hundred years: Stop using ‘I don’t care how long I live’ as an excuse for bad health habits. Behaviors like smoking, poor eating habits and inactivity are less likely to kill you than to sentence you to years or decades of chronic disease. The elders have seen the devastation that a bad lifestyle causes in the last decades of life — act now to prevent it.” Here’s the rest, titled “Top Ten Lessons for Living from the Wisest Americans.” My sister and I were lucky enough to receive a beautiful letter from our Dad adding his own wise words. That will be my favourite gift this year. Thanks, Poppy. Have a Kilner type jar of this on your coffee table for when the inevitable mid-evening munchies strike. There’s something for everyone here – mild curry spicing, hint of sweetness from the agave and dried fruit, and a sprinkling of flaky salt. It has no added fat and a reasonable amount of sugar, so no guilt. Bonus: because of the whole grains and nuts, it’s really filling too. Truly a top snack. Just a wee note: I have used cups for this recipe as it’s not important to get an exact measurement. If you don’t have proper measuring cups (I used American ones) just use a normal sized coffee mug. It’s about the same volume. Preheat your oven to 150C/300F. Line two large baking trays with baking parchment or Silpat. 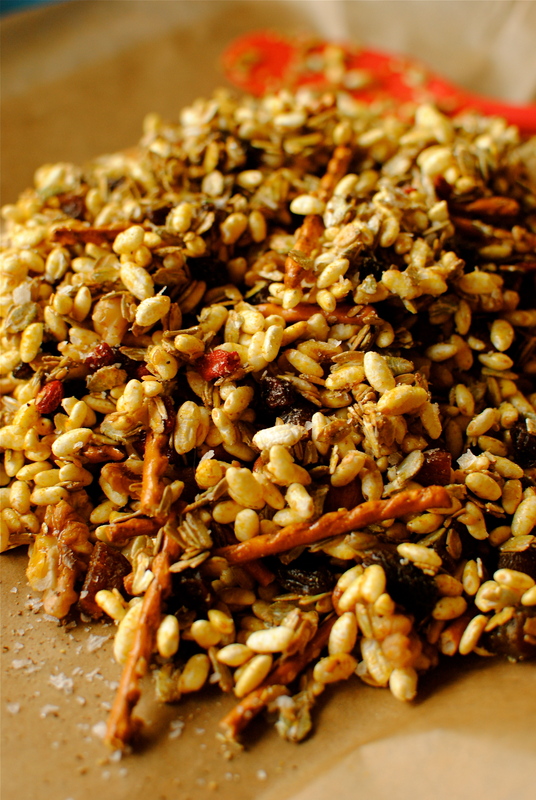 In the largest bowl you own mix together the cereals, pretzels, nuts, seeds and dried fruit. Use your hands to lift and gently toss the mix. Warm the agave or honey until it thins out; stir in the spices. Drizzle over the sweetened spices and gently stir through the mix until well-coated and a bit clumpy. Divide the bowl between the two trays and spread evenly; sprinkle over a little flaky salt. Bake in the oven for about 45 minutes, stirring every 15. Let the snack mix cool on the trays before storing in an airtight container, or dividing into little cellophane bags for sharing out. So easy, but so delicious. I’d love to receive a jar of this (with gluten-free grains of course 🙂 What a lovely gift! Sounds like you have a wonderful sister and father too. Looking forward to the rest of your homemade holiday gifts! I completely agree with you on giving homemade gifts like this. I think the time and effort you put into them is always appreciated, and they usually taste better and are healthier than their store-bought counterparts. 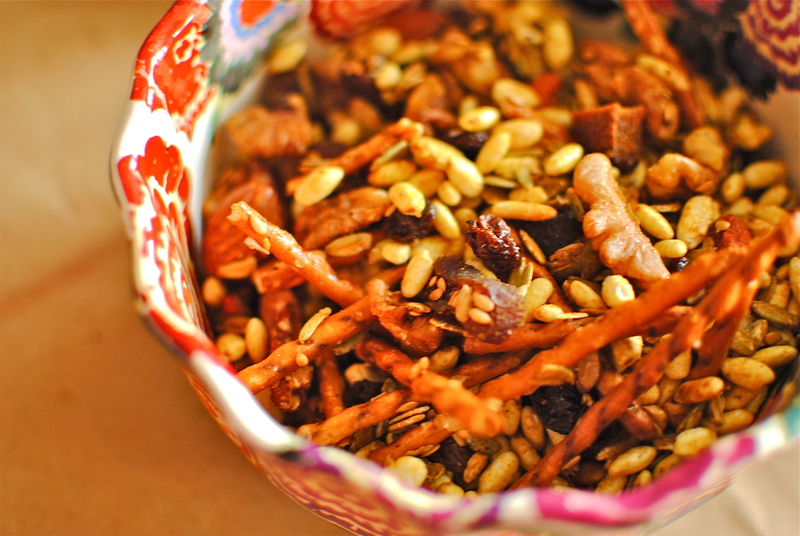 This mix looks wonderful with its sweet and spicy combo! Thank you, Faith. It really is very yummy and easy to put together. I’m sure the majority of people we both know would love homemade gifts. I would love to get anything that you make – all your recipes look amazing! 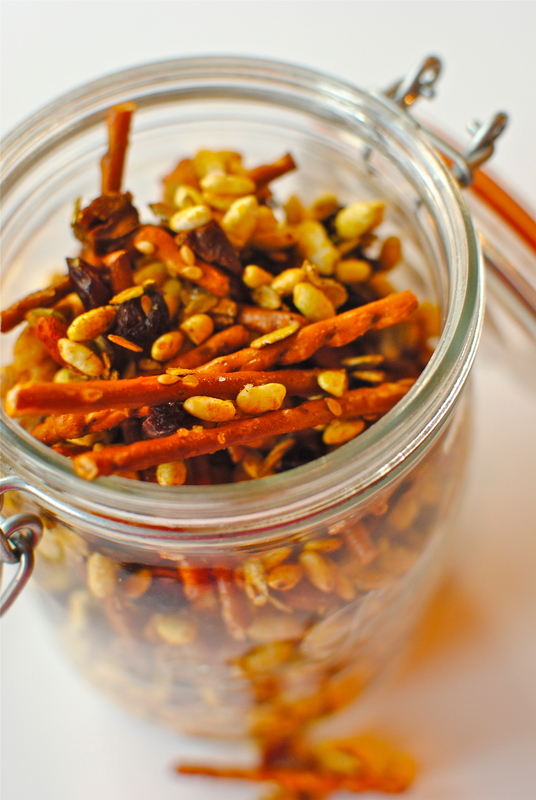 Your Sweet and Spicy Munch Mix sounds delicious! So much more flavor and yet with healthy ingredients than the standard holidays mixes with processed and sugared celeals. Thanks for sharing & happy holidays! Wow! This looks tasty 🙂 I typically don’t snack because of the lack of available, healthy options. Sometimes I’ll grab a Lara Bar but I wish I had some of this snack mix right now. Definitely going in my recipe book ASAP! Oh thanks Megan!I like the idea of being in your recipe book. Thanks for stopping by – I’ll have to check out your blog over the holidays. Especially as you are a fellow wordpresser! What a GREAT idea for munchy stuff and so healthy too! 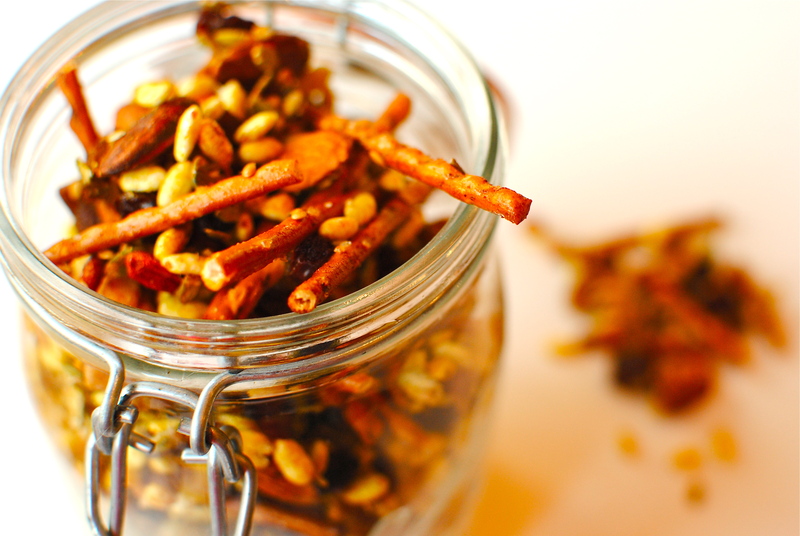 I usually make my own root crisps as a snack, but I love these!